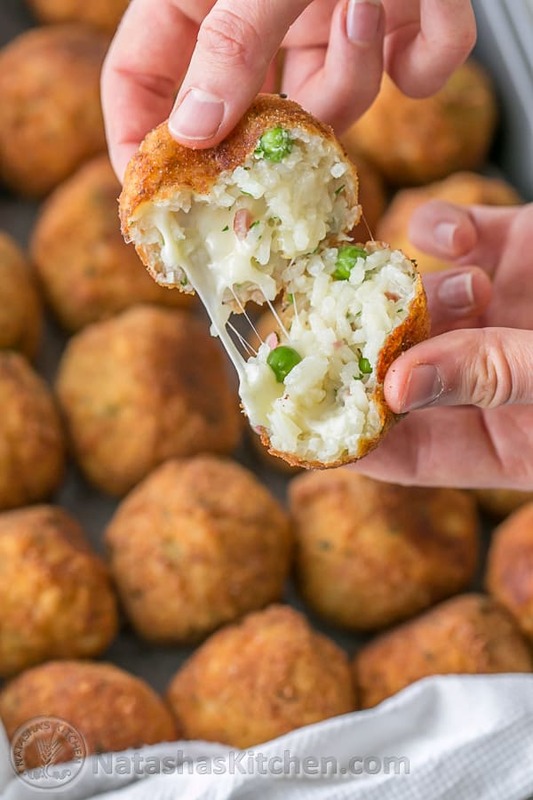 Children and adults love these cheesy rice balls. 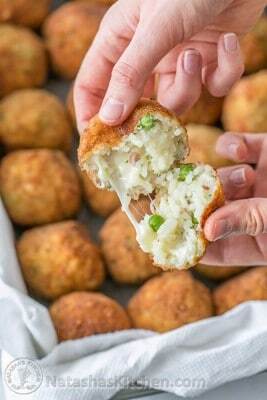 They are an Italian classic known as Arancini. These rice balls are such a treat fresh off the stove, stuffed with glorious gooey cheese. 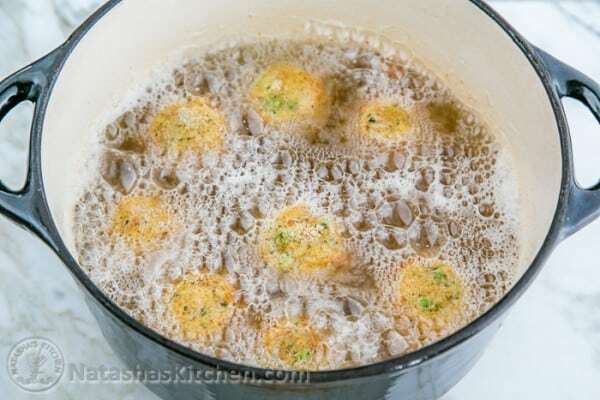 This recipe is similar in flavor to one of the most popular recipes on my site; the Creamy Chicken and Rice (a one-pot-meal) – if you loved that dish, you’ll enjoy these cheesy rice balls! 1. 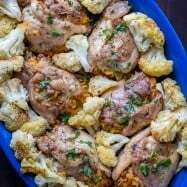 Using a dutch oven or heavy-bottomed pot with tight fitting lid, over medium/high heat, add 2 Tbsp olive oil and 2 Tbsp butter. When hot, stir in diced onion and sautee until soft and golden (4-5 min). Add finely diced ham and cook another 2 minutes or until meat is golden. Add rice and stir until coated with oil. 2. 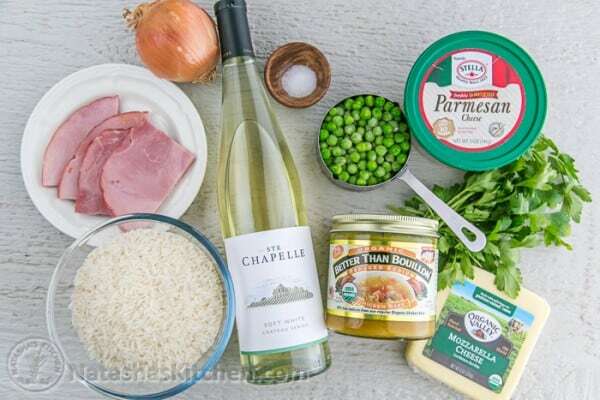 Pour in 1 cup white wine and cook until most of it has evaporated (2 min). Add 5 cups hot chicken broth and 1 tsp salt then cover and cook until liquid has been absorbed by the rice (about 15 min). Stir in the peas in, then cover with a tight fitting lid and finish cooking (2 min). 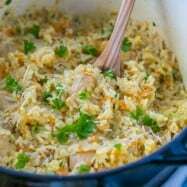 Rice should be soft and the liquid mostly absorbed. Spread rice mixture onto a large rimmed baking dish to cool. 3. 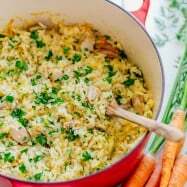 Once rice is cooled, stir in 1/3 cup finely chopped parsley and 1 cup parmesan cheese. Form rice balls using a heaping ice cream scoop for each. 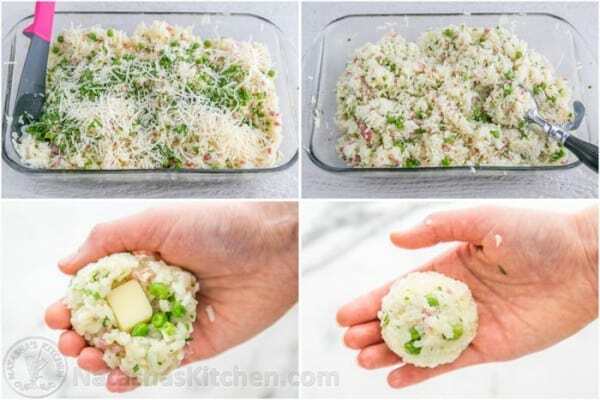 Stuff each rice ball with a cube of mozzarella cheese and form a tight ball with the rice mixture to enclose the cheese. 4. Set up 3 shallow bowls, the first one to have 1 cup flour, the second with 3 beaten eggs, the third with 1 1/2 cups bread crumbs. Dredge each rice ball in flour, shaking off the excess, then dip one-by-one in the beaten egg allowing excess egg to drip back into the bowl. 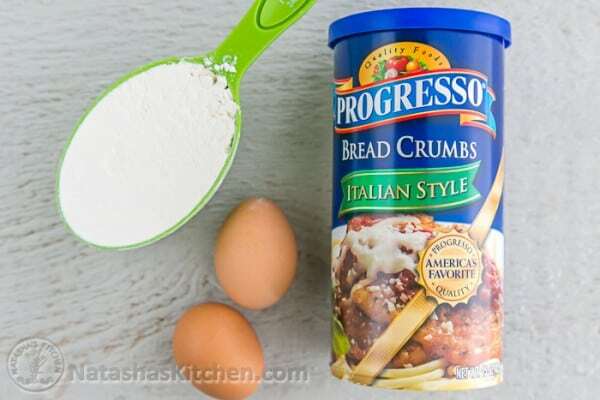 Finally, roll the balls in breadcrumbs until evenly coated. It’s best to roll and bread all of the rice balls before beginning frying since the frying is quick. 5. Add an inch of vegetable oil into a deep skillet or pot over medium heat (a pot is nice to reduce splatter). Once the oil is hot, add the breaded rice balls in batches without crowding the pot and cook about 3 minutes total per batch, turning to get all sides golden brown. Transfer to paper towels and serve warm with marinara, or with ranch (as my son prefers), or sans the dip and just enjoy ’em! :). 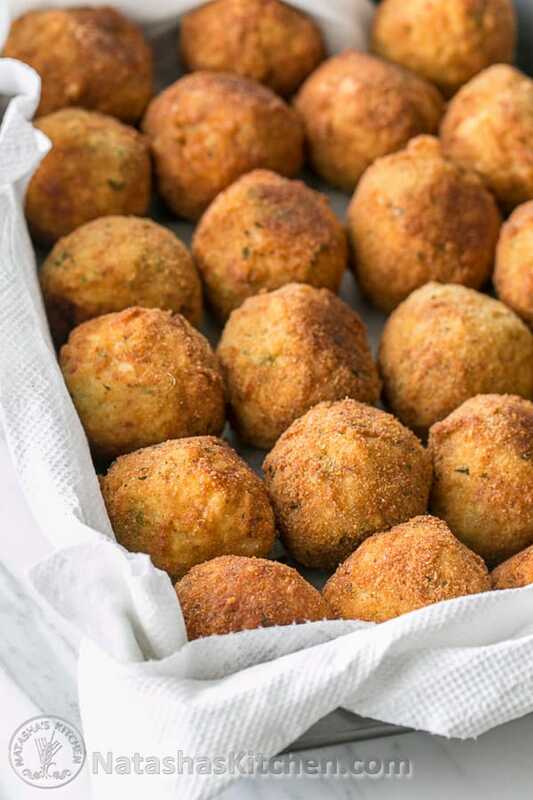 Credits: This recipe was adapted from one of my favorite Italian cooks: Lidia Matticchio Bastianich and is based on her “Arancini di Riso” (Rice Balls) from her newest book, Lidia’s Favorite Recipes. Thank you Lidia for introducing me to this wonderful treat! Children and adults love these cheesy rice balls. They're such a treat fresh off the stove stuffed with glorious gooey cheese. Using a dutch oven or heavy-bottomed pot with tight fitting lid, over medium/high heat, add 2 Tbsp olive oil and 2 Tbsp butter. When hot, stir in diced onion and sautee until soft and golden (4-5 min). Add finely diced ham and cook another 2 min or until golden. Add rice and stir to coat with oil. Pour in 1 cup white wine and cook until mostly evaporated (2 min). Add 5 cups hot low sodium chicken broth and 1 tsp salt then cover and cook until liquid has been absorbed by the rice (about 15 min). Stir in the peas in, then cover with a tight fitting lid and finish cooking (2 min). 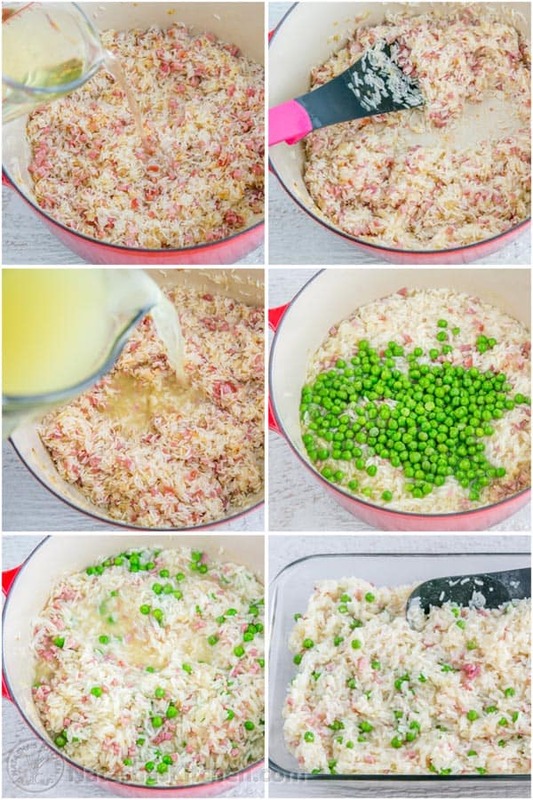 Rice should be soft and the liquid mostly absorbed. Spread rice mixture onto a large rimmed baking dish to cool. 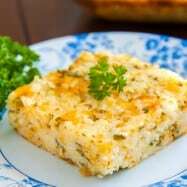 Once rice is cooled, stir in 1/3 cup finely chopped parsley and 1 cup parmesan cheese. Form rice balls using a heaping ice cream scoop for each. 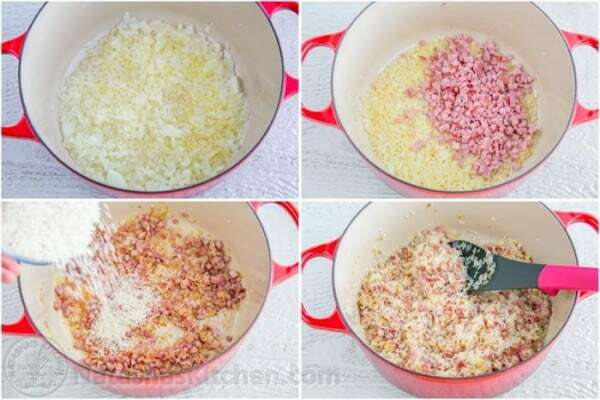 Stuff each rice ball with a cube of mozzarella cheese and form a tight ball with the rice mixture to enclose the cheese. Set up 3 shallow bowls, the first one to have 1 cup flour, the second with 3 beaten eggs, the third with 1 1/2 cups bread crumbs. 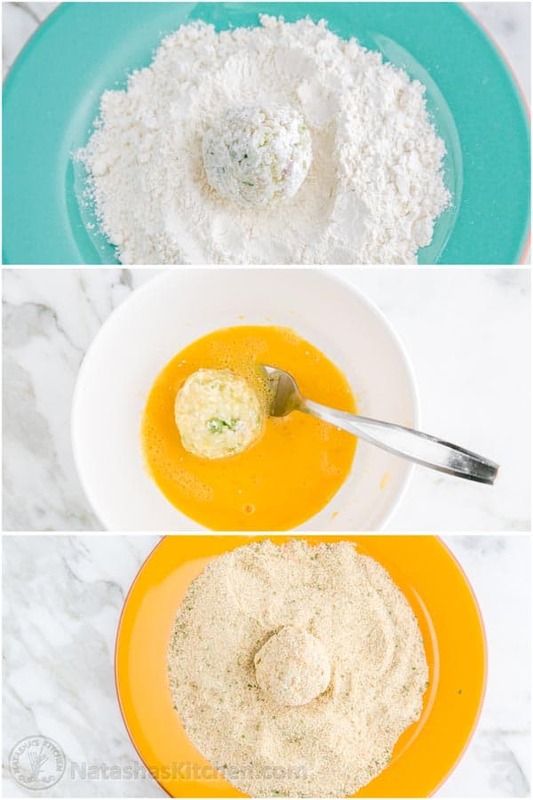 Dredge each rice ball in flour, shaking off the excess, then dip one-by-one in the beaten egg allowing excess egg to drip back into the bowl. Finally, roll balls in breadcrumbs until evenly coated. It's best to roll and bread all of the rice balls before beginning frying since the frying is quick. Add an inch of vegetable oil into a deep skillet or pot over medium heat (a pot is nice to reduce splatter). Once oil is hot, add the breaded rice balls in batches without crowding the pot and cook about 3 min total per batch, turning to get all sides golden brown. Transfer to paper towels and serve warm with marinara, or with ranch (as my son prefers), or sans the dip and just enjoy 'em! * The Le Creuset French Ovens are made to last a lifetime. They’re lovely too. * These Joseph Joseph utensils sit next to the stove and they get used. ALOT! Hi Natasha, I just finished making shrimp and lobster risotto and made extra for leftovers. I would love to make the rice balls with the leftovers. Do you think I would need to add anything to the rice? First time these fell apart and were not that amazing but then my husband asked for them again and I made a few changes and they turned out perfect! 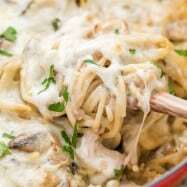 thank you for recipe. what’s substitue for wine? Hi Jenny, I honestly have zero experience with an air fryer so I won’t be much help with that. Can I make these a day in advance? If so, how should I go about reheating them? 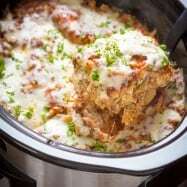 Do you think it’s ok to make the balls the night before and then bread and fry the next day? I am salivating right now and reminiscing about my trip to Italy a few months ago. We had these same rice balls from a hole in the wall pizza place in Naples and they were freshly fried and SO GOOD! With that being said, I would like to ask about substitutions. We don’t consume alcohol whether cooked in or otherwise. Is the white wine an absolute (not the vodka haha)? Or can we replace it with something else? Also, regarding ham…no pork household..any viable substitutions? I don’t want the taste to be too different. Although how would I know what the original tastes like, right? Let me know if anyone has any advice! Thanks!